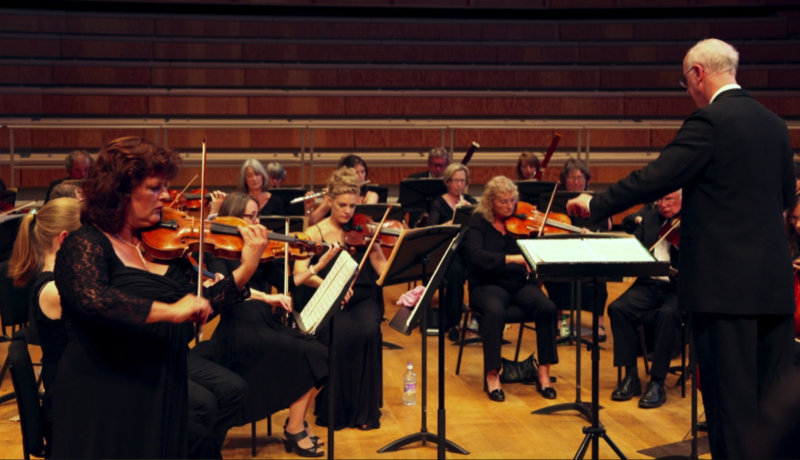 Andrew Lowen conducted The Canterbury Orchestra in a thrilling concert of American music at the Shirley Hall. The brass and woodwind sections gave us a rousing start with Sousa's Liberty Bell March, followed by the whole orchestra in John Henry by Aaron Copland. This powerful piece is based on a folksong and portrays a railroad-building slave who competes against a mechanical steam hammer doing the same work. The hero wins the day, only to die later from his exertions! The orchestra's Leader, Chris Brown, then took up the baton to conduct Barber's haunting Adagio for Strings, played with romantic fervour and controlled passion. The guest soloist of the evening, Scottish pianist, Peter Foggitt then produced a wonderful account of Gershwin's Rhapsody in Blue. His playing had a classically-trained discipline and he was ably supported by the orchestra who brought off the jazzy effects as to the manor born. It is interesting to note that the original jazz band parts were arranged by Ferde Grofé and labelled by the first names of the players rather than the instruments. After the interval came a bubbly account of Bernstein's Candide Overture, Appalachian Spring by Copland and Gershwin's Porgy & Bess Suite, with its popular tunes. Altogether a magnificent concert presented with great enthusiasm by these dedicated players.